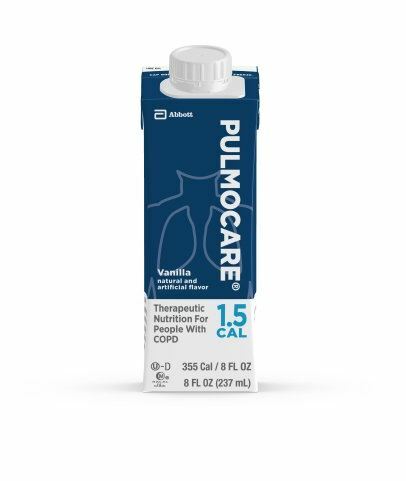 Pulmocare Supplement is designed for people with chronic obstructive pulmonary disease (COPD), cystic fibrosis, or respiratory failure who may benefit from a high-calorie, modified carbohydrate and fat, enteral formula that may help reduce diet-induced carbon dioxide production. 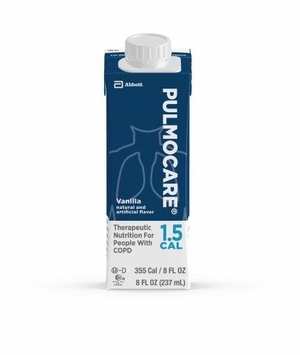 Pulmocare Drink can be used as supplemental or sole-source nutrition. Each can contains 355 calories with 20% of fat as MCT to enhance fat absorption, and has 24 essential vitamins and minerals. Halal, Kosher, gluten-free, low-residue, and suitable for lactose intolerance. Comes in vanilla flavor. :: Ingredients (Unflavored): Water, Sodium & Calcium Caseinates, Sugar (Sucrose), Canola Oil, Corn Maltodextrin, Medium-Chain Triglycerides, Corn Oil, High Oleic Safflower Oil, Magnesium Chloride, Calcium Phosphate, Soy Lecithin, Potassium Citrate, Natural & Artificial Flavors, Sodium Citrate, Potassium Phosphate, Ascorbic Acid, Choline Chloride, Taurine, L-Carnitine, Gellan Gum, Salt (Sodium Chloride), Zinc Sulfate, d-Alpha-Tocopheryl Acetate, Ferrous Sulfate, Niacinamide, Calcium Pantothenate, Manganese Sulfate, Cupric Sulfate, Thiamine Chloride Hydrochloride, Pyridoxine Hydrochloride, Riboflavin, Beta-Carotene, Vitamin A Palmitate, Folic Acid, Biotin, Chromium Chloride, Sodium Molybdate, Potassium Iodide, Sodium Selenate, Phylloquinone, Cyanocobalamin, and Vitamin D3.